It seems like every street in Bangkok has an apartment block being built these days. New apartment blocks selling “happiness”, “lifestyle” and “freedom” are advertised on every street corner and inside every train station. As I sigh at the concept of property ownership and marvel at the workers putting the new block opposite mine together, seemingly by hand, I wonder, is it really worth buying an apartment in Bangkok, or anywhere else in Thailand for that matter? Though the idea of owning property and being tied to one place has never really appealed to me, at one time or another, most of us are forced down that route, either for want of stability or to have something to leave our kids. On the face of it, buying an apartment in Thailand seems like a fantastic deal. 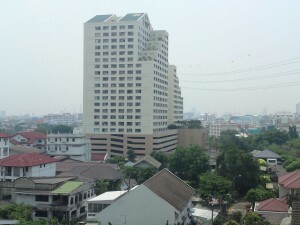 For £40,000 you can get a decent one bedroom place in Bangkok. If you want somewhere nearer the centre of town, you are looking at about £80,000-100,000 for a two bedroom apartment. Go rural, however, or even to the city of Chiang Mai, and you can pick up a decent one bedroom place for £20-30,000. Getting on the property ladder at these prices is a dream come true, right? Personally, I think not. Take a deeper look at the condo market in Thailand and you’ll see the false economy. For a start, building standards in Thailand are poor, period. I remember a builder friend of mine nearly having a heart attack when he say how the builders were constructing an apartment block opposite his hotel. But the workers aren’t to blame. Low paid, and often low-skilled, they are expected to build entire apartment blocks, pretty much by hand. Indeed the lack of power tools used is a huge concern. And it’s not like the tools aren;t available to rent; it’s just that the developers want to save money at all costs. On this very subject, just the other day a guy was sent to re-lay two tiles in my room. He was given a screwdriver and an ageing portion of cement in a plastic bag to do the job. Needless to say the tiles are already wobbling and will no doubt be cracked by next month.